Nicole Stirling finds solace in spending hours in her home studio — with candles lit and music on — getting lost in her artistic process. Pulling from nature, color, patterns and music for inspiration, the Kings Beach native creates colorfully intricate, painted mandalas, jewelry and beaded creations. 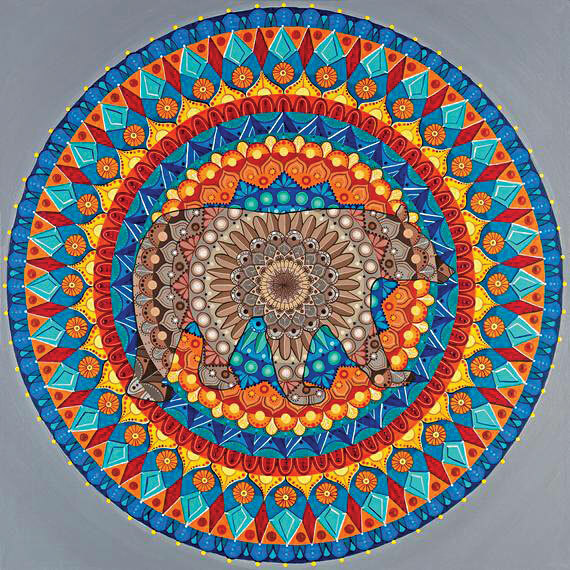 Her latest acrylic-painted mandala features a brown bear surrounded by blue, turquoise, orange, red and yellow flowers and jewels, which took her 100 hours to create. A prolific artist, Stirling uses various mediums in her artwork. 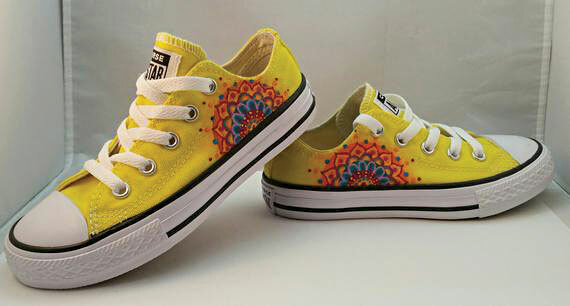 She draws and paints mandalas on canvas and Converse sneakers, incorporates rocks and beadwork to make necklaces and bracelets, and uses alcohol inks and resin to produce abstract and geometric earrings and necklaces. 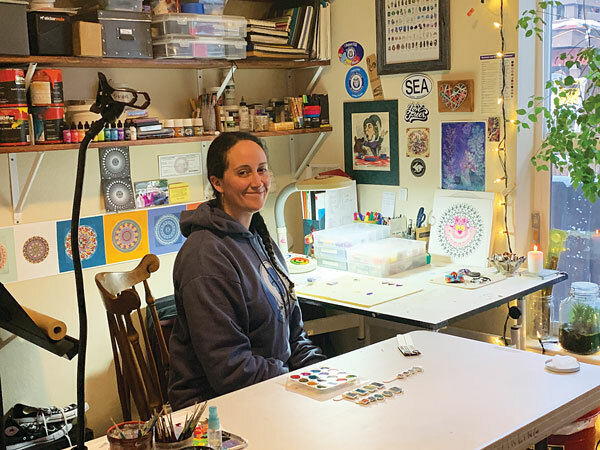 While she equally loves all three mediums — noting that the resin jewelry is her biggest seller — Stirling contends that most of her time is spent painting mandalas. 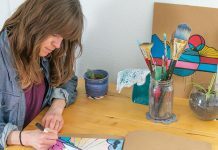 She has 15 original mandala paintings, ranging from a black-and-white snowflake painted on clarinet reeds to brightly colored, detailed mandalas featuring Lake Tahoe. Her latest acrylic-painted mandala features a brown bear surrounded by blue, turquoise, orange, red and yellow flowers and jewels, which took her 100 hours to create. Her mom had been asking for a bear mandala for years and Stirling personally likes the color blue and how turquoise and orange look together, informing the painting. 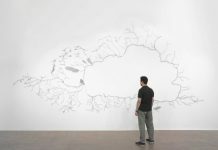 But each mandala, which can take anywhere from 60 to 100 hours to complete, has its own story. A 1997 graduate of North Tahoe High School, Stirling loved to paint as a child, painting on anything she could: chairs, walls, gear shifts. But her first creative outlet came in the form of music. She attended California State University, Chico, earning a Bachelor of Arts degree in music performance. 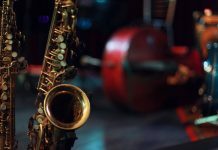 She played clarinet for the North State Symphony, among other classical ensembles. It was at Chico where she met her husband, Dave, an art major. She took painting classes and really fell in love with the form. Stirling sees a lot of similarities between music and painting, stating that music has “a lot of patterns and rhythm” like the mandalas she creates. After college, Nicole and Dave moved to Seattle for 10 years. 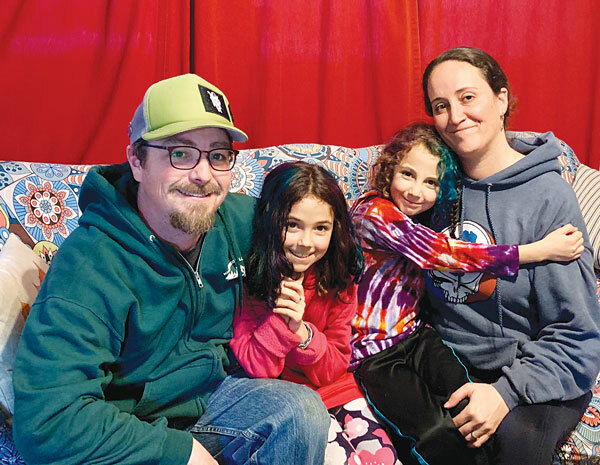 But after having their children — Harper, 9, and Zoie, 8 — the Stirlings realized they wanted a different life for their kids. Nicole moved her family to Kings Beach in 2011 and reconnected with the lake. It wasn’t too long after moving back to Tahoe that she began making more art and selling her wares. While her full-time job is as director of Incline Village Nursery School, she tries to spend as much time generating her colorful artworks. Dave, who is also a painter, said he admires his wife’s artwork and creativity. Indeed, the Stirling house resembles an art gallery, with Nicole’s artwork dotting the walls and furniture. On display are also other artists she admires, such as photographer friend Phil Mosby. The two have collaborated on projects in the past; she enjoys that kind of partnership. 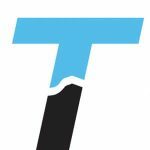 She is also passionate about making her work affordable to those who may not be able to spend a lot on an original piece of artwork. She reprints her mandalas on canvas, hand stretched by her husband. Stirling Studios, the moniker she uses to sell her art, also offers prints and stickers of her paintings.